Featuring Garmin Adventurous Routing™ options for those twisty, hilly, terrain-hugging rides you love, zûmo 595LM is the motorcycle navigator “built to thrill.” Its large, glove-friendly 5.0-inch high-res touchscreen can be viewed in landscape or portrait mode. And transflective technology gives it a bright, crisp color display that reduces glare and is easy to read in sunlight. Sync your zûmo with a compatible smartphone² and a Bluetooth-enabled compatible headset or helmet (sold separately), and you can make and receive wireless calls without having to remove your gloves or helmet. Safely stow your phone in a pocket or saddlebag, and still have the benefit of hands-free calling without diverting your attention from the road. You can also receive customizable smart notifications³ for calls, texts, app alerts and more that appear right on your navigation display. What’s happening on the road ahead? zûmo 595LM can connect you to live weather radar and traffic information via the wireless Smartphone Link app. This app also enables LiveTrack, a nifty feature that lets friends track your whereabouts whenever you’re out on a ride. Want to take your own soundtrack along for the ride? Your zûmo also lets you control music and media from a compatible MP3 player or smartphone², right on your touchscreen display — and you can even stream the playlists you love from popular Pandora and Spotify music services³. 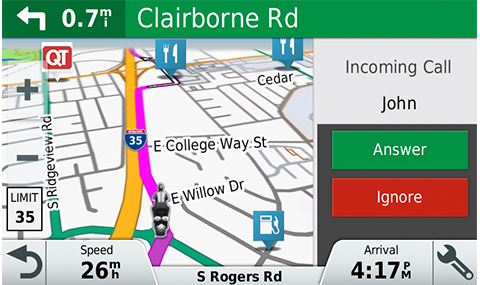 To enhance road awareness and encourage a safer ride, zûmo 595LM provides helpful alerts for sharp curves ahead, speed changes, railroad and animal crossings, school zones and more. 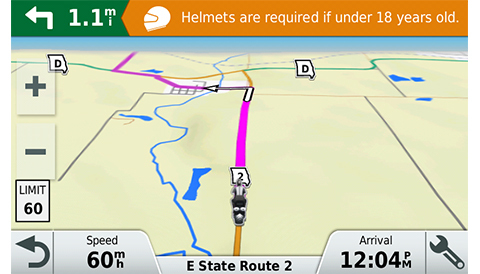 Additionally, you’re notified when you need to check state helmet laws — or when you’re about to drive the wrong way on a one-way street. You also receive alerts for nearby red light and speed cameras¹. Plus, for longer rides, a fatigue warning4 will even suggest break times and potential rest areas worth considering after hours on the road. The zûmo Up Ahead feature lets you easily see places of interest and milestones along your route, without leaving the map view on your navigation display. Plus, Easy Route Shaping lets you add a point on the map to adjust your route, so you can ride through preferred areas or follow specific roads. A built-in trip computer with digital fuel gauge comes standard with your zûmo 595LM. So it’s easy to estimate how many miles you can ride before you’ll be running on empty. 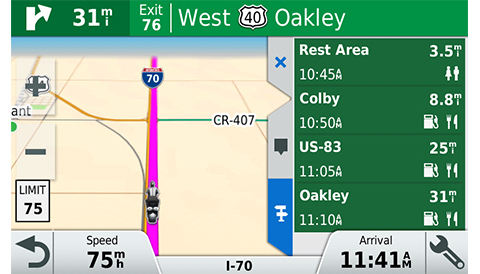 Dynamic fuel stop alerts actually prompt you when it’s time to refuel and even provide gas station location options. A helpful speed limit indicator lets you know when it’s time to throttle down. Plus, a digital compass display and a database of motorcycle-specific points of interest (POIs) are on hand to help you locate cycle repair services, dealers and more. There’s also a Service History Log on your zûmo to help you keep track of service dates, mileage and performed maintenance on your bike. zûmo 595LM includes free map updates5 for the useful life of your device, so routes reflect the most up-to-date points of interest and maps available. photoReal Junction View displays realistic views of junctions and interchanges on your route to ease navigation through complex interchanges. 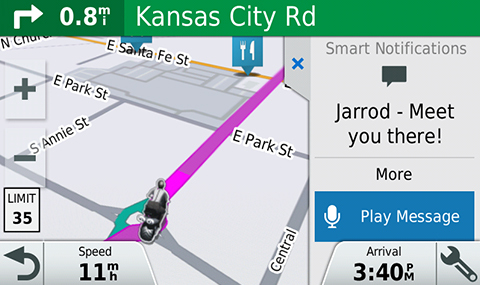 A brightly colored arrow on the zûmo display, along with helpful voice prompts, will indicate the proper lane position needed for your next turn or exit. zûmo 595 displays 3D Terrain and elevation information. 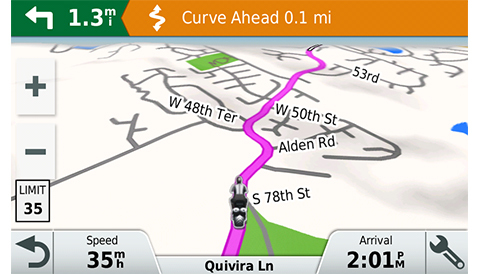 There’s also a TracBack® feature on zûmo that allows you to navigate the same route, in reverse, for your return trip. For added protection on the road, zûmo 595LM is compatible with the Garmin Tire Pressure Monitor Sensor (TPMS, sold separately). One TPMS is required for each tire and will work with metal valve stems only. TPMS uses wireless technology to transmit the tire pressure data, letting you view it in real time right on your zûmo display. To record the highlights of your ride, zûmo 595LM is compatible with the Garmin VIRB series of HD action cameras (sold separately). Remotely control VIRB – start and stop recording – all from from your zûmo display. It’s easy and fun to record relive every adventure. 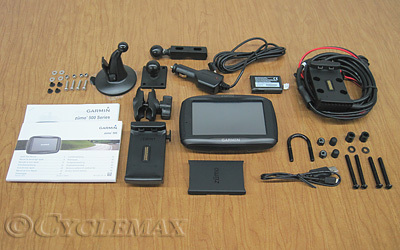 Use Garmin Express to keep your zûmo 595LM up to date. 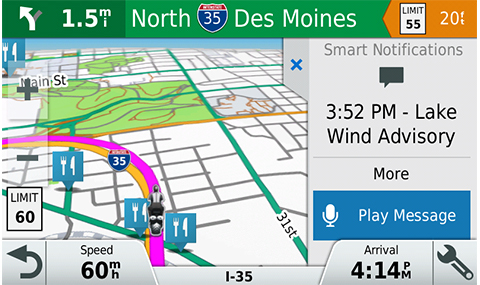 Garmin Express makes it easy to update maps and software, transfer favorites to and from devices and install free custom vehicles and voices. Plus, for added versatility, your zûmo 595LM also comes with an automotive mount and power cable — in addition to its motorcycle mount — so you can use it on the vehicles you drive, as well as on the ones you ride. Pandora, the Pandora logo, and the Pandora trade dress are trademarks or registered trademarks of Pandora Media, Inc. iPhone, iPod touch and Mac are registered trademarks of Apple. SPOTIFY and the Spotify logo are among the registered trademarks of Spotify AB. Foursquare® is a registered trademark.